“The term factory outlet refers to stores in which manufacturers sell their goods directly to consumers, thereby saving the costs of distribution and retailing, some portion of which they pass on to consumers in the form of discounted prices.” Marianne Conroy, Discount Dreams: Factory Outlet Malls, Consumption, and the Performance of Middle-Class Identify, 54 Social Text 63 at 65 (Spring, 1998). Value Retail News defines an outlet center as “one in which 50% or more of the tenants are manufacturer’s outlets.” Research Data, Value Retail News (archived 6/9/2008). I propose that outlet malls can be classified according to the following types: (1) the factory, (2) the strip mall, (3) the cloisters, and (4) the walled city. For many years, manufacturers sold damaged or surplus goods at low prices to factory employees. A. Coughlan and D. Soberman, A Survey of Outlet Mall Retailing: Past, Present, and Future, 2004/36/MKT INSEAD (Working Paper Series). Mens clothing manufacturer Anderson-Little is widely credited as the first to sell such goods directly to the general public. In 1936, Anderson-Little opened a salesroom in their Fall River factory and shortly thereafter, they opened stores at non-factory locations. The first multi-tenant outlet mall was opened in Reading, PA in 1974 by lingerie manufacturer Vanity Fair on the former site of a hosiery mill. Following a similar concept, Stanley Tanger opened Burlington Manufacturer’s Outlet Center in Burlington, NC in 1981. 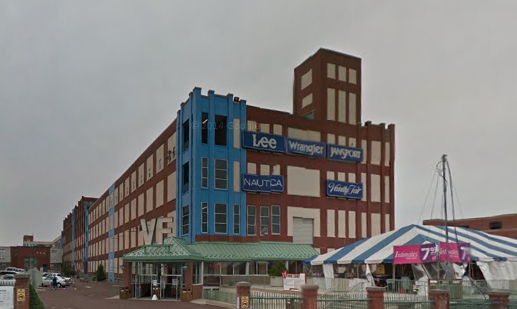 Both projects spawned outlet mall empires in their own right. The rest is well-known. Untethered from the factory, outlet malls were hurled into the wilderness–whirling, growing. They landed far removed from city centers, often in proximity to vacation areas. And so hurled, they thrived. As of March 2014, there were 193 outlet centers in the United States, occupying a combined 77.5 million square feet of gross leasable area. Characteristics of this type include architectural forms common to American industrial architecture, such as repetitive structures, large prominent windows, and a thoroughgoing lack of ornament, maybe punctuated by an occasional tower. And brick. Lots of brick. See e.g. Jevremovic et al., Aesthetics of Industrial Architecture in the Context of Industrial Buildings Conversion PhIDAC (2012). 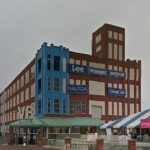 Examples of factory-type malls include the original VF Factory in Reading, PA, the American Tin Cannery in Pacific Grove, CA, the Blue Ridge Outlet Center in Martinsburg, WV (originally a wool mill, now closed), and Howland Place in New Bedford, MA (former mill converted to outlet stores, since converted to mixed use office space). They exhibit the characteristics typical to factories described above–probably because they used to be factories. 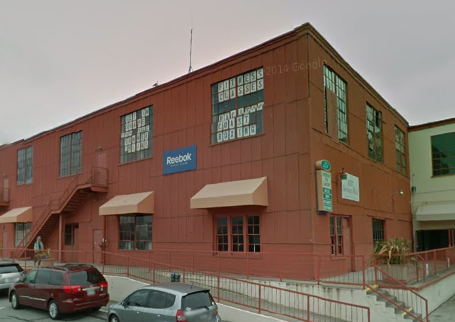 The factory-type outlet mall is increasingly rare, but vestiges of the factory-type mall persist to this day. For example, one scholar noted that, “Potomac Mills retains the aura of the old-line factory outlet–most obviously in its name and its industrial-minimalist decor….” Conroy at 66. The name — Mills — recalls the earliest outlet retailers like Anderson-Little that sold discount goods directly to consumers from the factory itself. The name also reflects those earliest outlet malls housed in former factories or structures fabricated to appear as such. But the Mills-type outlet malls also reflect a third aspect of the modern factory — the transformation from small-scale cottage industry to large-scale manufacturing. “The new machinery for weaving soon outgrew the cottage workshop, and it became necessary to build factories to house the inventions of Arkwright and his contemporaries.” Munce, Industrial Architecture; an Analysis of International Building Practice 2 (1960). In this way, the factory came to stand for the concept of accumulated mass itself. And thus Potomac Mills (and then Franklin Mills), in their successive bids to become the largest outlet malls, also channeled this unbridled spirit of accumulated mass. The Mills-type outlet mall also suggests a fourth aspect of the factory. In order to adapt a former factory to the scheme of a shopping mall, the cavernous space had to be carved into individual stores. 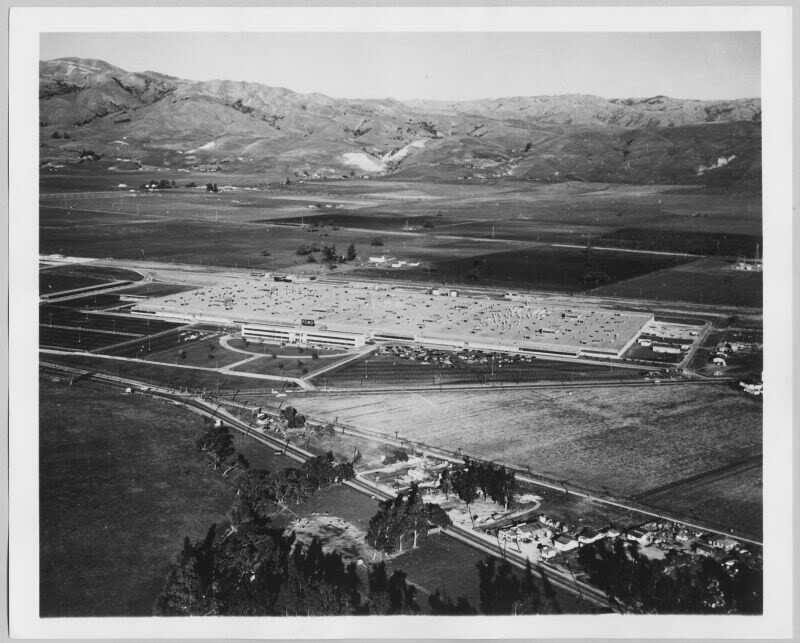 Thus, the earliest factory outlet malls adopted plans that utilized internal hallways and internal access to stores. The Mills-style, perhaps because of its sheer size, continues to follow this plan. 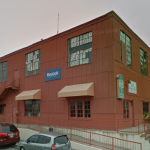 Indeed, the connection may be most explicit in the Great Mall of the Bay Area — a former Mills property — which occupies the former Ford Motor Company San Jose Assembly Plant. The “strip mall” type of outlet mall exhibits characteristics typical of strip malls. A strip mall is an “[a]ttached row of stores or service outlets managed as a coherent retail entity, with on-site parking usually located in front of the stores.” International Council of Shopping Centers classification. 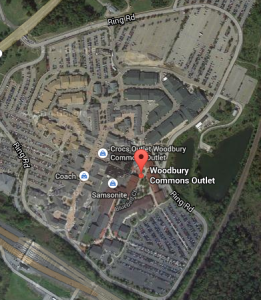 A “strip mall” outlet type meets the above definition, but with outlet stores as tenants. The ICSC notes that, “[a] strip center may be configured in a straight line, or have an ‘L’ or ‘U’ shape.” Some examples include Tanger Outlets in West Branch, MI; Shasta Outlets in Anderson CA; and Tanger Outlets in Nags Head, NC. 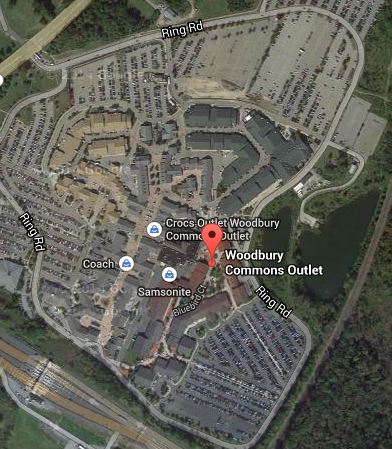 The cloister-type outlet mall is characterized by a ring of stores facing inward. The outer edge of the complex offers an impervious, windowless barrier–except for several narrow points of access. At the center, lies a vast sea of asphalt–the parking lot. Generally speaking, a cloister is a “covered walkway or ambulatory around an open quadrangle in a monastery, college, or monastic cathedral.” Dictionary of Architecture and Building Construction (2008). The cloister is related to the strip mall — especially strip malls arranged in a “U” shape. Just a few examples: Tanger Outlets in Riverhead, NY, Allen Premium Outlets in Allen, TX, and Camarillo Premium Outlets in Camarillo, CA. 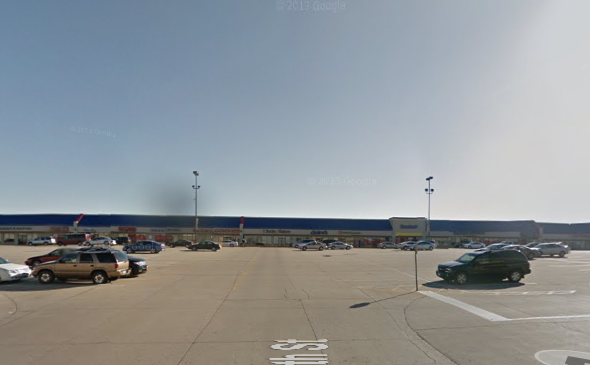 Some “U-shaped” strip malls are cloisters as well. For example, the Barstow Tanger Outlets is a U-shaped strip mall. It is effectively a cloister because Interstate 15 forms a barrier on the fourth side. The arched covered walkways in the Oak Creek Factory Outlets scream cloister. 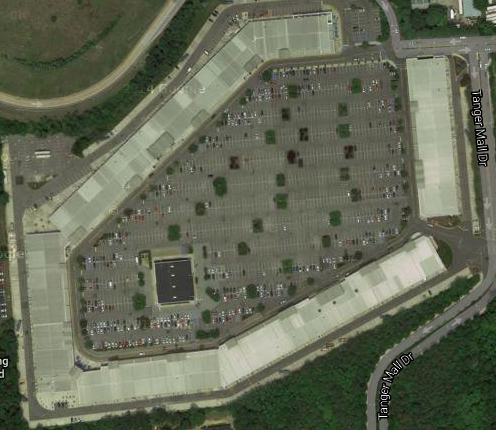 Roland Barthes’s observations in Empire of Signs (Center-City, Empty Center) are relevant to the cloister outlet mall. Barthes noted our “synesthetic sentiment of the City…requires that any urban space have a center to go to….” Empire of Signs at 30. Barthes stated, “The city I am talking about (Tokyo) offers this precious paradox: it does possess a center, but this center is empty.” Id. at 31. One of the two most powerful cities of modernity is thereby built around an opaque ring of walls, streams, roofs, and trees whose own center is no more than an evap­orated notion, subsisting here, not in order to irradiate power, but to give to the entire urban movement the support of its central emptiness, forcing the traffic to make a perperual detour. Id. And in the same way, the cloister-type outlet mall presents the same paradox. It has a center, but the center is empty. It is no more than an evaporated notion, existing only to give the surrounding structure the support of its central emptiness. The walled-city type outlet mall is a popular, more recent, entrant to the outlet mall typology. The walled city type mall seeks to simulate a town or village. Like the cloister, it is protected by the same type of outer wall formed by the inward-facing stores. There are many examples of this type. Usually the mall adopts architecture reflective of its region. 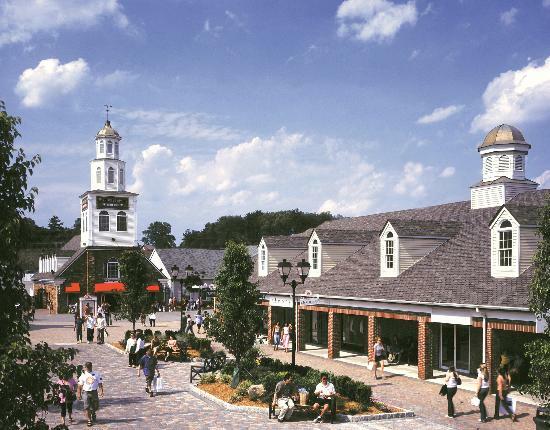 For example, Woodbury Commons generally exhibits an American colonial style of architecture. Other malls take cues from other mileau. Las Americas Premium Outlets, on the US-Mexico border, is a “Mediterranean village-inspired mall” with “wide, winding walkways with a few scattered tile-top tables and wrought-iron benches.” Why is San Ysidro Such a Shopping Mecca?, UT San Diego (3/19/2012). Merrimack Premium Outlets are another example, featuring a simulated New England village. Disneyland is presented as imaginary in order to make us believe that the rest is real, whereas all of Los Angeles and the America that surrounds it are no longer real, but belong to the hyperreal order and to the order of simulation. It is no longer a question of a false representation of reality (ideology) but of concealing the fact that the real is no longer real, and thus of saving the reality principle. Simulation and Simulacra at 12-13 (1994). In the same way, walled-city outlet malls are presented as imaginary to make us believe that the rest is real; that idealized colonial or New England villages still exist, and with them, the simple values and communities that we supposed are embodied by them. The recent preference for this type of form may bear some correlation with the pervasive disillusionment with the modern suburban form as failing to provide meaningful communities. Clearly, these classifications are not strict nor exhaustive. In fact, many outlet malls mix and match aspects of each typology. And new patterns are emerging as well. But enough outlet malls seem to follow these patterns that this typology can serve as a rough framework for analysis.